I was at he launch of Apollo 11 and only 13 years old. 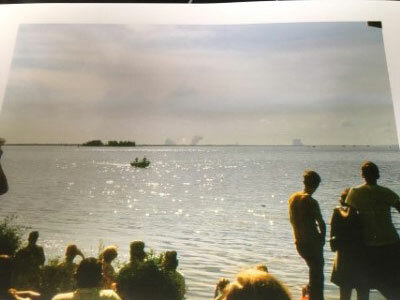 Going through some of my parents slides of my family watching I am now trying to track down where we saw the launch from. That morning we came from the Orlando area and that's about all I know. I'm guessing around Titusville but do not know. I have some photos and I know things change in 49 years. In one picture, a bridge or causeway and in the background two water towers, a steeple or monument but by a town, the island off the shoreline looking towards the rocket and the VAB. I have two of the launch not sure of the orientation which is right — VAB on right or left of 39A Pad? The roadway and causeway and water tower and steeple would be best clues and local knowledge how close you could be to the launch site on roads. 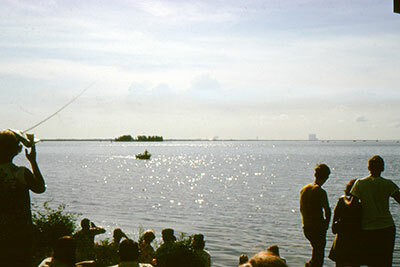 The distance of the VAB but not sure of zoom angle of camera in those days. Any help or direction would be great. Nice photos -- thanks for sharing! And welcome to the forum! I'll let others more familiar comment on the location referenced in the pictures. The La Quinta in Cocoa Beach used to be the Cape Colony Inn, which was owned by the 7 Mercury astronauts. There is a plaque (with several misspellings) in the courtyard of the hotel to commemorate he history, and in the lobby area they have a limited display of space program memorabilia. Across the street from the La Quinta is the International Palms hotel, which used to be Henri Landwirth's Holiday Inn (where the Mercury astronauts often stayed when they traveled to the Cape from Langley Air Force Base). There has been a lot of construction in the ensuing 57 years or so, but if you walk around the grounds you can easily distinguish the "Holiday-Inn-looking" buildings and the old pool where many a party was held (I think that's the pool where Gordo Cooper stocked it with fish whose life spans were severely shortened by the chlorine). Just south of the Hilton Oceanfront is Lori Wilson Park, and on the northern edge of that park is a street called "I Dream of Jeannie Lane". Do yourself a favor and visit the Air Force Sands Space History Center, located just outside the south gate of Cape Canaveral Air Force Station. Entry is free (but please leave a nice donation! ), and the best part is... talk to the docents! They are virtually all former workers and engineers at the Cape, and they have some GREAT stories to tell! Do yourself another favor and visit the American Space Museum and Walk of Fame in Titusville. There will almost always be someone there who worked at the space center, often several, and they have some GREAT displays. Ok, I am out of airspeed and ideas, someone else can chime in with more options. There are still quite a few interesting sights to see if you know where to look! Also, do a search on the forum for the old hotels and motels — there is a lot of info there about where they were, what is on the sites now, etc. Good luck! 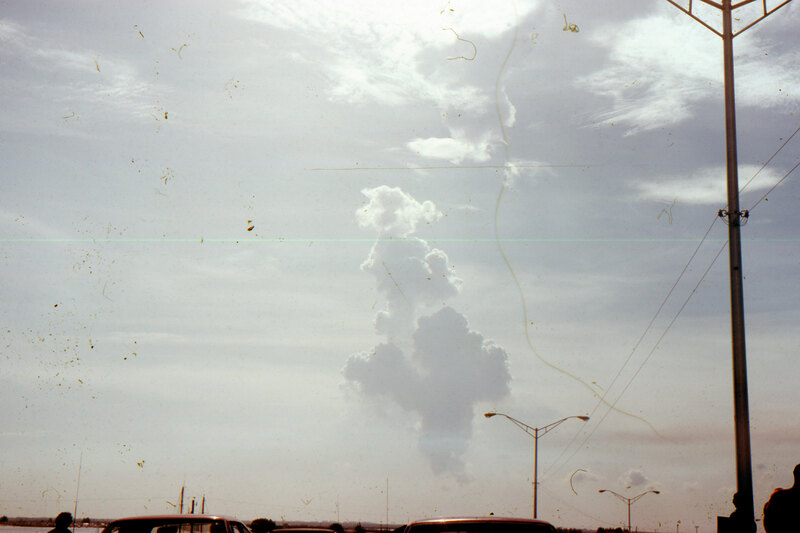 From what I can tell from the photos above the correct orientation of the launch photo is the lower view with the VAB on the right and the launch tower on the left. I believe this to be the correct view by the shape of the VAB with the Launch Control Centre to the right of the VAB. The next clue in these details is the Mobile Service Structure midway between the launch tower and VAB. To get this perspective the viewing location would be along the waterfront in Titusville near or on the bridge crossing the Indian River on the A Max Brewer Memorial Parkway. The final clue to confirm this location is the stand of larger trees in the photo. I believe these trees to be located on an island in the river making these trees much closer to the viewer than the trees on the other side of the river. Using Google Maps I believe if you select street view on a location of Sand Point, Titusville and select a street view location just on the bridge you have a similar view to this photo with the Google Map Camera elevated higher than the Photo Camera lens. A better resolution copy of this photo would give more detail to better identify the location. With the angle of the sun/shadow on the people in the photo the sun is approximately 45 degrees to the left. This would be where the sun was positioned in the sky at 9:30am. 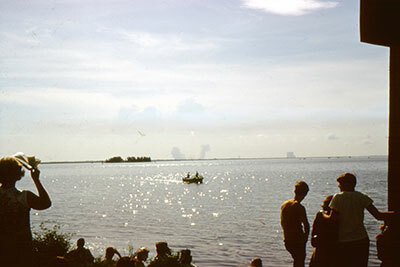 and the people viewing the launch facing south east for the VAB and almost due east for the launch. Like you, Mark, I was about the same age when Apollo 11 blasted off on man's first lunar landing mission, and also in Brevard County, FL, while observing the liftoff on Merritt Island, just a few short miles from Titusville across the Indian River. It looks like your posted photos on launch day in July 1969 were from the Titusville area alongside the Indian River on South Washington Avenue, and probably not too far from State Road 406 that connects north Titusville to the space center (Gate 3). I would say, judging from your pictures, Mark, that you were about 9 miles away from the actual launch pad complex. I have looked a little closer at your photos and found that the photo showing a view looking along the bridge shows the railing shape with square posts and railing. This article shows the same details for the old bridge with the new bridge construction adjacent. It may also be that every bridge in the area has a similar design, this is something someone local may be able to confirm. I hope this helps. 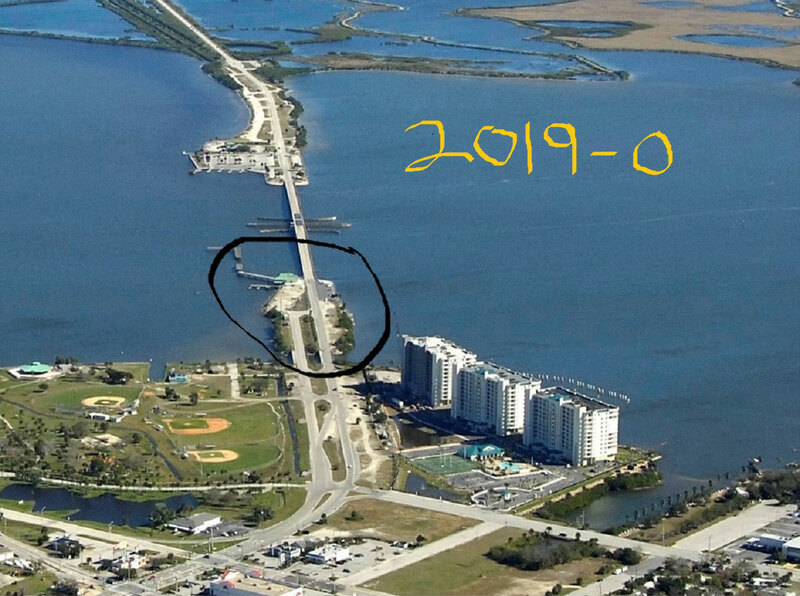 As Oly has pointed out, yes, the bridge photo(s) is indeed SR406, the new Max Brewer Bridge, mentioned in my above posting from the north Titusville area. 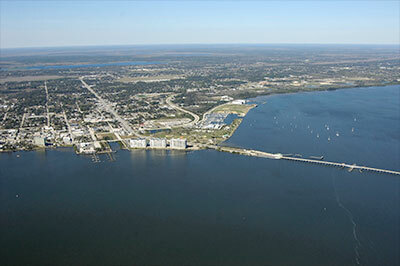 The newly constructed bridge, joining Titusville and Merritt Island/KSC, was in use since Jan. 2011. Thanks for all the info. I felt we had to be at Titusville but wasn't sure and thought it might have been the old bridge but someone local would be able to tell in a minute. If you travel south of Titusville I saw nothing long on the water where there was a bridge? The second photo with the man walking over to me would then need to be reversed, as in this photo it looks like looking back into town and the watertanks and steeple you can see but the people on the right side are watching the launch and that would be northward. 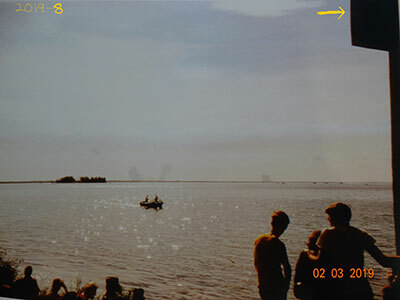 So the picture needs to be flipped so the people are on the left side and that would make them looking towards the VAB. A picture of the old bridge would ID this bridge. If all the photos were taken in the morning you could use the shadow direction in the photo to give you an idea of direction. Your first and fourth pictures are the same photo. Just one print is reversed. Ken is correct, you viewed from the Rt. 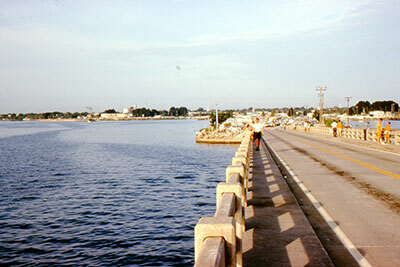 406 bridge in northern Titusville. Here is a map if you want to return to the spot. There is a new, taller bridge there today, built recently. Distance from your vantage point to the launch was 11.5 miles. The fourth photo is the correct orientation; the first is reversed left to right. The second photo is not reversed, it is correct, and you are facing Titusville to the west with the sunrise to the northeast in July. Thanks for all the responses, I still have some questions and will check all the info you all have provided, thanks. I know the first and fourth are the same but did not know the orientation which was correct but I have that correct now, the VAB to the right, launch to the left. I realize the view is to the west as you can see town water towers and steeple in both, but aren't they reversed if I'm looking west? Would not the people looking to the launch be on the left or south side of the road/bridge where it shows me on the right or north side of the bridge? To me, we would be near the entrance to the bridge maybe around the new launch viewing site built prior to entering the bridge by the water? You would want to be on the south for a southeast east viewing area not on the right north side of the bridge? At least I got the area right, so I will look at your photos and maps. The article on the bridge is priceless and definitely is the same bridge we were on. Thanks again for all your help. I believe that your second photo is correctly oriented based on the following facts. The shadow from the railing if this photo was indeed taken the morning of the launch is in the correct position and the photographer seems to be on the bridge facing westward. Due to the clarity and size of your posted photo I cannot make out how many people or what subject they are looking at, perhaps the helicopter flying along the waterfront seen in the fifth photo. (I have seen footage taken from a similar helicopter with its shadow visible on the waterfront showing people gathered to watch the launch. Perhaps you may be in such footage.) Maybe this photo was taken while people waited for the launch. If I was there on the day I would not turn to take a photo of the crowd as the rocket was climbing skyward. Your third photo I also cannot make out enough detail to determine if the license tags of the cars are correct or mirrored. This would be the most obvious way to correctly view the photo. Additional details such as what side the steering wheel is or any signage in the background would also work. Once you have the correct view you can then determine what direction the photographer was facing if this photo was taken on the same morning. If it was taken that afternoon then all bets are off. Sorry I cannot make out any additional detail. Good luck with your exploration of the area. If you visit any of the sights capoetc mentions above perhaps you will find a local that has good local knowledge. I have done my best from the other side of the world. All photos were taken the morning of the launch by my father. I'd say the ones on the bridge were taken waiting/prior to the launch so they may have been looking at the helicopter. Where would I access the photo from the helicopter if we were in it? I scanned some slides to make the prints I posted. I'm in Cocoa now. When I return home I can scan detailed areas of the slides to make out cars and orientation. I can't do that now. I will check the photos with shadows. I could be seeing things (as I do), but the fourth photo seems to show the actual launch. I see two "clouds" to the right of the tree-colored island with a bright spot in between them. These features are not in the earlier image showing the tree-covered island, even accounting for one of the images being flipped from the other. Also, the first and fourth images are not the same, as previously posted. The speedboat's size and distance relative to the tree-covered island vary from the first image to the fourth image. Both the first and fourth snapshots depict the AS-506 launch. The first picture appears to be a reverse image, though, but all the same people and posses are the same as in Shot #4. 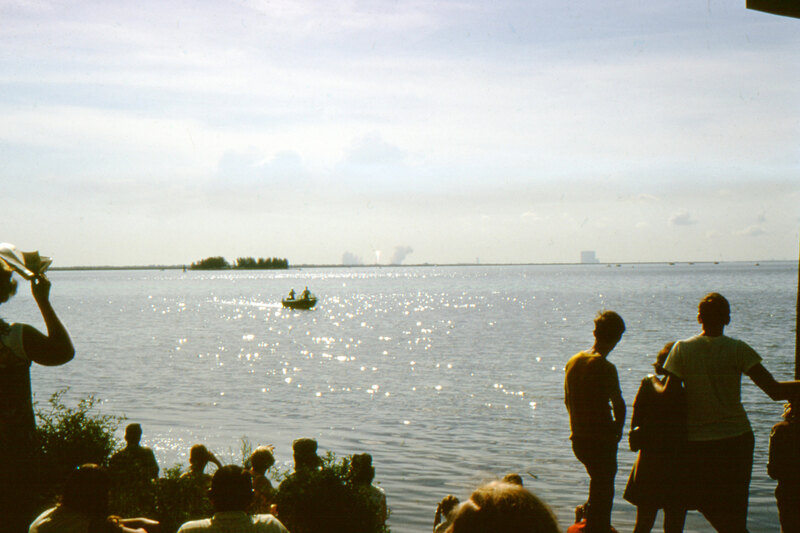 When in Titusville along the Indian River, you can see the VAB across the river with LC-39 to the left (north). All the other launch pad facilities will be on the right side of the VAB many miles south, but usually not visible from this area. Think that last image should also be flipped horizontally. Flow of traffic would have been right to left and drivers pulled over to the right hand shoulder to claim their temporary homesteads. Also note that nice old red Mustang is showing its driver side, as evidenced by the silver exterior rearview mirror. Those early models did not have an outside mirror on the passenger side door. Thanks for the pics and hope you're having fun in sunny Florida. The red Mustang in the fifth photo is also seen in the third photo. Where would I access the photo from the helicopter if we were in it?. 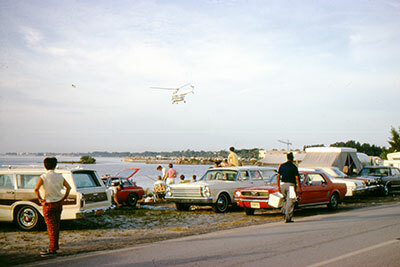 There are many feet of film footage shot of this event, A quick internet search found this Spectators watching Apollo 11 launch, which shows a crowd gathered near the Penneys department store site that was at 2500 S. Washington Ave., Titusville, just south of your location at the time. Amazing info I am getting. Thanks to all. Sorry I was off for a while visiting fiends. I am back in sunny Pennsylvania (not) and I have the slides. I will look at getting the right orientation. By all the facts I was on the old bridge at Titusville watching the launch and yes the rocket is in view in both photos. I just want to get the exact spot. The bridge picture shows another road at the angle. I want to know if this is the side entrance and if this is the main entrance to the bridge by the shore before it goes across to Merritt. It has the town too close in the background to be further out in the bay. To me it could be at where the new Space Launch Park is now but the railings would not make sense. I will get back once I look at pictures. I just want to get the exact spot. How are your trigonometry skills? If you can study the photos to determine the position of the MSS and the distance between the launch pad and MSS and also MSS to the VAB, this will give you a line of sight back towards the bridge. If when you study the photo in better detail you may be able to identify details on the opposite shore that confirm your position. Just doing a quick check with the resolution you have posted seems to show with the position of the island, Launch site, MSS and VAB that the photographer was standing when viewed from Google maps, at a position near water's edge at the bridge. This can be backed up with the people in the foreground and the plant life around them so they are on the shore or base of bridge. If you move the camera south, the island moves to the left of shot too far and if you move the camera position on to the bridge the island would block the launch pad. The other photos look to have been shot at various points in this area. Be careful estimating how far the town is from the camera because this perspective changes with different focal length camera lens and equipment with longer lens giving a compressed field of view. You have some special photos here. Yes I am thinking about trig? I think I'm nuts but maybe passing age 60 I am reliving my youth. Last night I was looking at a nautical boating chart and it has compass settings but obviously none are printed where the VAB or launch sites are. But in my photo, the island to the left — now I know its 49 years ago — but I think the island is the one in the Google Earth and in front is a red bouy channel marker and I'm trying to identify this to confirm the island. From the location I am at you can see the red marker just to the left of the island and then trig to the launch site which you have the red/orange glow of the rocket and the VAB. I know this is the spot but I want an exact. I need a aeriel picture of the beginning of the bridge and with the pics I have railing lights cars street intersection I can find the spot. I have pics of the old bridge but can't zoom in on it. I have noticed from these pics there are three big condos that were not there and this might be part of where we were. They are there with the old bridge pre-2011 but I need a pic prior to the condos to see the start of the causeway. The first three pictures once the new ones get posted show the red Mustang at the intersection of the V in the road. 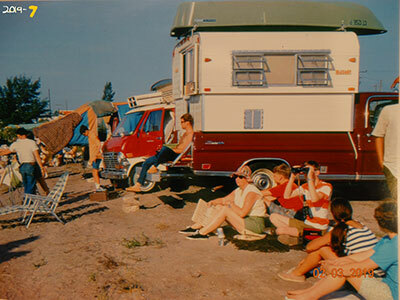 I am just to the left with the camper and the green boat on top. So we are close I just need an old bridge street view and aerial photo? 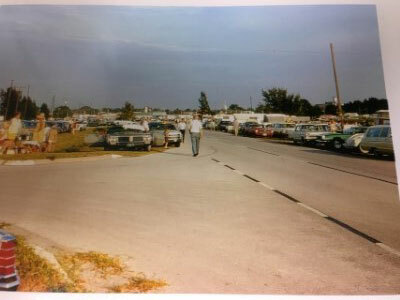 I contacted Titusville History to try and find what I'm looking for. Again thanks for all the info. I am looking at it, searching every night on this. Assuming all these photos were taken on the same day in the same location and similar time, the camper van with green boat in the first photo is also in the third photo on the left edge of frame. This third photo also has what looks to be a church steeple above the tree line right of the red mustang. This steeple can also be viewed in the fourth photo taken on the bridge. This church seems to be red brick with white steeple. Using Google Maps, a similar church steeple is located at the corner of Main St. and Hopkins Ave., Titusville and can be identified as the First Baptist Church. This is a red brick building and the profile of the steeple is the same however the spire may have been repainted. This is not definitive proof because many churches have a similar construction. The crane visible in the second and fourth photo tie these photo locations together. The waterfront area below the helicopter in the second photo seems to match what is Veterans Memorial Park and the site of Wells Fargo bank. This puts the general location on the waterfront at or near the base of the old A Max Brewer Memorial Parkway bridge. Google Maps satellite view shows that the new bridge was constructed on the southern side of the old bridge with the roadways being realigned in the area. The V in the road may not exist anymore. Also the area on the waterfront that has three large condo buildings may have been constructed on reclaimed land that did not exist in 1969 however someone with local knowledge may be able to confirm this. So the location that the launch photos were taken may be where the base of the new bridge was built or the site of the three condos. My words exactly. I agree with the Baptist church as I see it on Google Earth also. And yes, all were taking the morning of the launch. 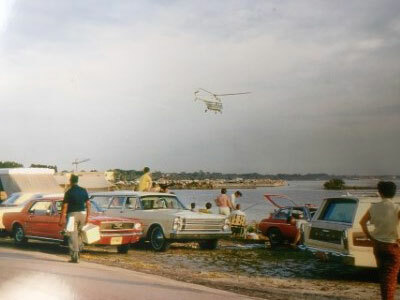 The car with the green boat on is where I was standing as you can see me in the first picture and the boat and Mustang car are in three pictures. The new bridge was built in 2011 and the condos, three of them were present but not sure how long prior to 2011. What I need is a picture of the old bridge west side prior to 2011 or prior to the condominiums going up. I have one aerial picture of the old bridge but not able to zoom in enough to see the V in the road and positive ID. Also the V in the road has areas on both sides for cars and people. 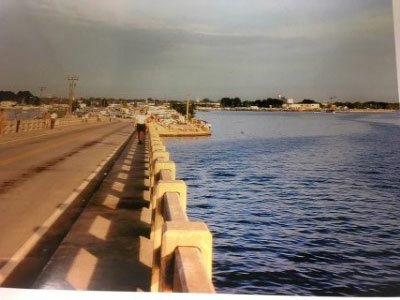 If you look at the picture taken on the bridge it seems a long way back to the coastline of the town and also the bridge is all over water from the V section. This is the part I am looking for from the air? I have contacted the historical society of Titusville. There has to be pictures of the bridge or even from 1969 when the historic flight was and local coverage of people on the bridge. I thank you for your help and I'm very close to the spot. When I was there I tried to take a picture from spots on the shore but none of them was at the same angle and if I could print a photo and use some angles maybe I could get a point. I tried Google Earth but not an expert, but limited views and angles with it. I tried street side but none on the water and limited on the bridge. I am still searching as there are to be historic pictures on Google Maps or Earth that you can go back in time but I would have to be 2011 but I cannot find where you click on to get a prior date? Google Earth Pro in fact has historical shots back to 1994 for the area in question that shows the old bridge and prior to the condo construction. The top row of tool icons, 7th button shows historical imagery. The resolution of the photo is low but the details you need look to be present. The best pre condo photo resolution is 2004 and the condo construction is underway 2005. Looking at the old 1994 shot the details show your photo taken looking back from the bridge towards Titusville matches the shore line profile of the old bridge base which is an island. There is a section of roadway that may match your V road on this island however the detail is not find enough to confirm this, however a photo taken from this location would put the church into the background. Perhaps the V road is the road to the west of the area that previously had baseball fields and now looks to have lakes on this site. I will check the history of Google Earth Pro and I think you are correct as I think I am close to it on another picture. Picture 2 has the helicopter and to the right is water where the condos are, so it must be fill to build on. Photo 3 the road to the Y. Just west of the bridge in picture 4 you see land the Y and room for cars to the right. That's because the bridge was two lanes both ways so they are on the north side of the bridge and westbound lanes. You will see the telephone poles well to the right so its all land. Photo 4 the land just west of the bridge with the man walking over is a small section of the bridge with land on both ends. So where the bridge meets the land west the Y cars and I am on the left and cars and people are on the right. But to the right of this is water again all the way back to Titusville but you can't see it. The land south of bridge was fill for condos and the land to right was fill for what are ballparks... it fits. It's the only place it could be. First photo with the rocket the island is in view, it's still there and the water buoy is to the left if you look close and it's still on the nautical map. When I was there I should have walked the west side of the bridge until I had the same look in the camera as the old photo even though a lot higher. I took one over the first part but this put the island too far out of picture different angle. Take a look at the below photo (source). You see the bridge and the three condos. Click on it to zoom in just to the right of the condos, where the water starts. This is just a short span from the mainland to another plot of land with a small bridge with a railing like the one with the man walking over. As soon as it reaches the mainland you can see the road and a right turn and a Y. This is the only area of the bridge it could be at. There is land to the right and land to the left and it's the first section out over the water. You cannot tell how short the bridge is from my photo but it shows the parallel road that the Y takes you to. But really to confirm it I need a prior to condo picture or better yet a 1969 picture. Okay, again thanks for all the help, I'm one or two photos away. I would think the historical society would have some old photos. You may find this piece from the Smithsonian.com interesting. This video also has shots taken in the Titusville area. at 18 seconds and again at 30 seconds there are shots that look to have been taken in the same area as your shots. And another taken further south. Here is the latest after studying slide 3. What I had been calling the Y, the turn off to the right where the people are having lunch, the white spot on the curve, that is the center of the turn on the west side or a V facing us. 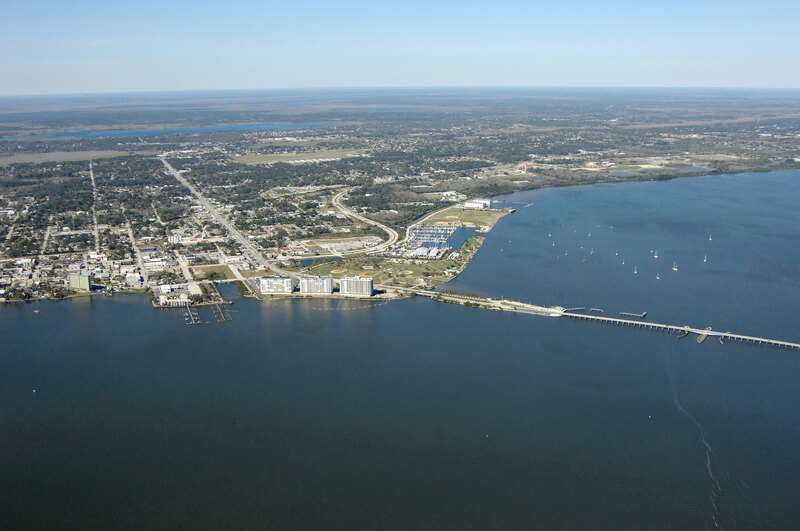 If you look on the Titusville Harbor link I sent and picture 3 or directly over the bridge facing west towards town and click once to zoom in, find the green roof building right at the water's edge parking lot on the left. (All on the island just east of the condos.) You see the same intersection; it is not a Y, it's a V on the west side. This has to be the turn we see on pic 3. I can't find it now but it was mentioned the phone poles you see in Apollo no. 3, the line crossing the road to the poles seen on the no. 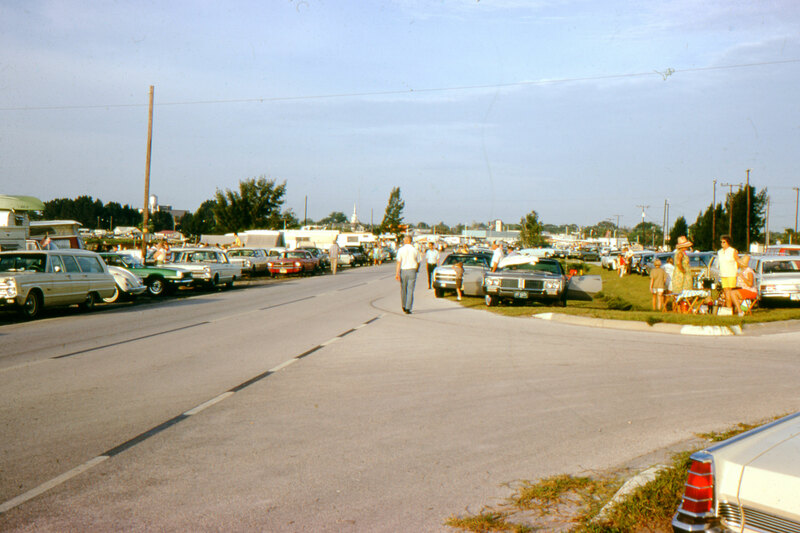 4 picture you can notice on the Titusville Harbor pics but can't zoom in close. Far right picture Apollo no. 4 you see like a dock or pier and railing or poles but do not see this in any aerial pics from Titusville Harbor. One last thing the gentleman who drew the lines from the VAB, 39A, launch control back to the land, I believe it's too far south where you have them together to a point. I would like to draw the back using Apollo pic no. 5. Using the island with the buoy sticking out of the water just to the left of the island and the 39A which is orange and the VAB. I'm working on a nautical chart if I can patch it together and draw lines. I think this will bring it just across the street from the V intersection where we are watching. I watched the clip on camping and it was neat. My parents had the Apache trailer along. 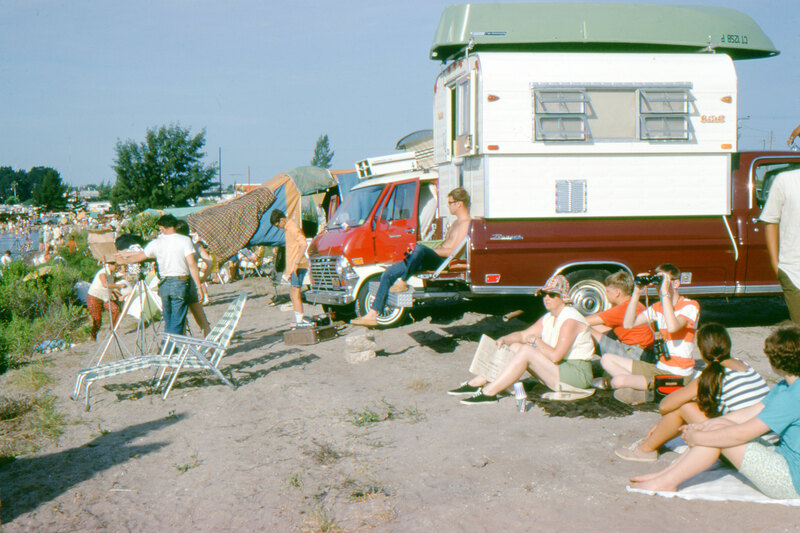 I'm not sure why we did not camp, as that is how we got down to Florida from Pennsylvania. We stayed at some dumpy hotel with a major mosquito infested place but thank God we did and I saw the launch, I was lucky. 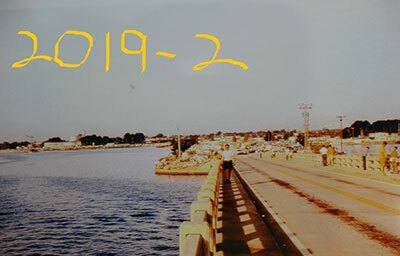 Thanks again, getting closer just need one photo of bridge in 1969 or in the 70s. 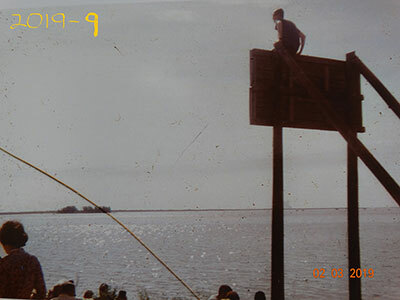 Here is a summary of what I have found out in the last year in my quest to locate where I was for the Apollo 11 launch in 1969 with my family as the 50th anniversary of the launch will take place this July. The pictures all have 2019 and a number after to help sort through this mess. We will start with no. 0. 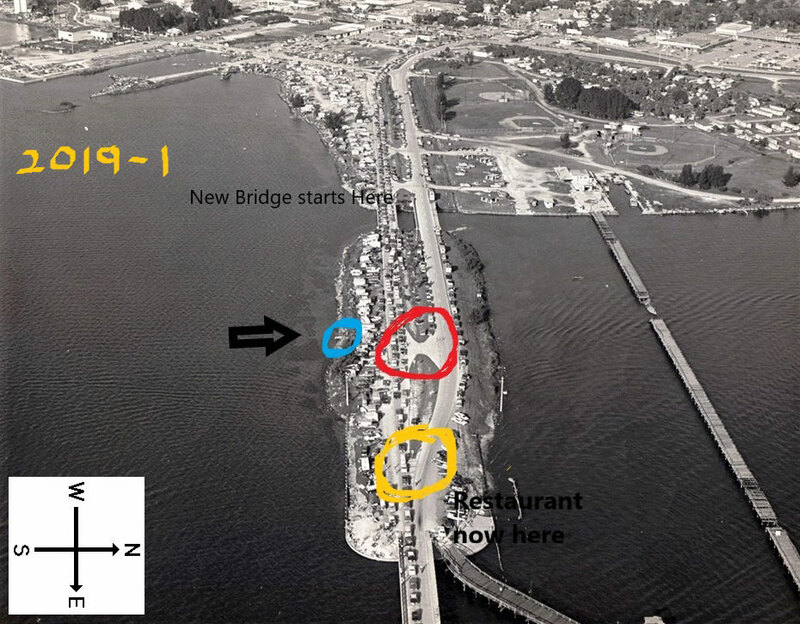 This shows the Max Brewer Bridge and the first section is circled in black, this is Sand Island and it has been identified as the spot where we were, but not the exact spot. 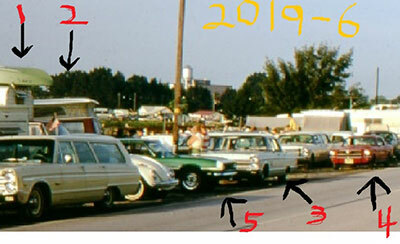 I have been trying to get the exact location to take a picture from the same area some 50 years later. Of course a lot has changed in those 50 years. Just last month, I located a picture of this island from a museum in Titusville, which is what I have been looking for this past year. It is a big help but the focus of it will not answer all my questions but gives me more then I had. Picture no. 1 is this picture and I will get to the colored circles in a minute. Let's go to picture no. 2, this is looking to the west towards Sand Island and Titusville and from the bridge you can see it lands on Sand Island and then goes to parallel roads but not much detail as you have with picture no. 1. The next picture shows the same slide blown up with an arrow pointing to a red sign with a white border around it, the location of this sign can be seen with a black arrow pointing to the blue circle on the aerial picture I just found picture no. 1. I call this a billboard but I was informed from the people at the museum that it is a sign showing a warning of an underground cable in the water by the island. This sign is no longer there but this picture has made my spot that much more certain. Picture no. 4 shows an arrow showing the intersection to the right and a white car to the left which is my family Plymouth Fury. All along I thought we were located at the first intersection of Sand Island looking to the west on picture 1, but the second intersection on my picture no. 4 clearly is the intersection on the aerial view shown on no. 1 red circle. This is important with the new info about the sign. So if we zoom in on the cars in picture no. 6 you see the Plymouth between a red Mustang and a very nice '68 or '69 Green Camaro but to the left is the important stuff. Look at number 1 arrow and number 2 arrow on picture 6 you notice a green boat on top of a truck and a red van camper top arrow 2. Now look at picture no. 7 see the truck with the green boat and the red van with the camper on top, well I'm located at the rear tire of the truck with my mother in a hat with sunglasses and my brother looking through the binoculars. Picture no. 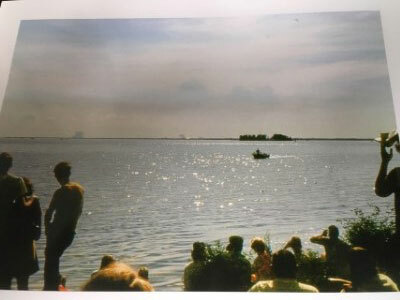 8 shows the rocket, boat in the river the island to the left and the VAB on the right and then the arrow to the billboard or sign and this is where we were sitting just to the left or east of the sign. Picture no. 9 shows this quite well as my father snapped a couple of pics with the sign/billboard just to the right of where we were sitting. 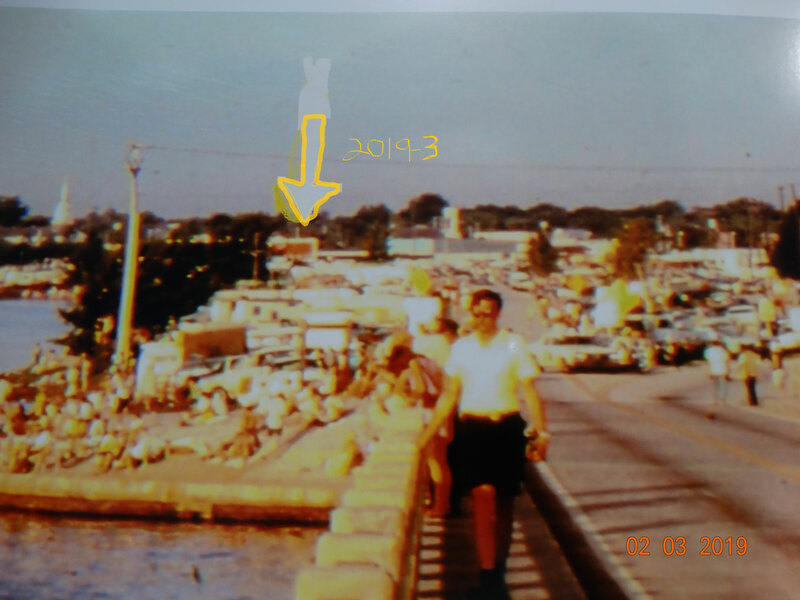 So the intersection and the cars shows us to be abeam the camper and boat and the billboard, so I know I was on that section of the island, which I could not verify until this picture no. 1 was found. 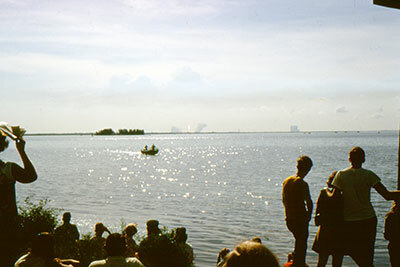 It was taken in 1970, not at the Apollo 11 launch, but not much had changed in that one year. 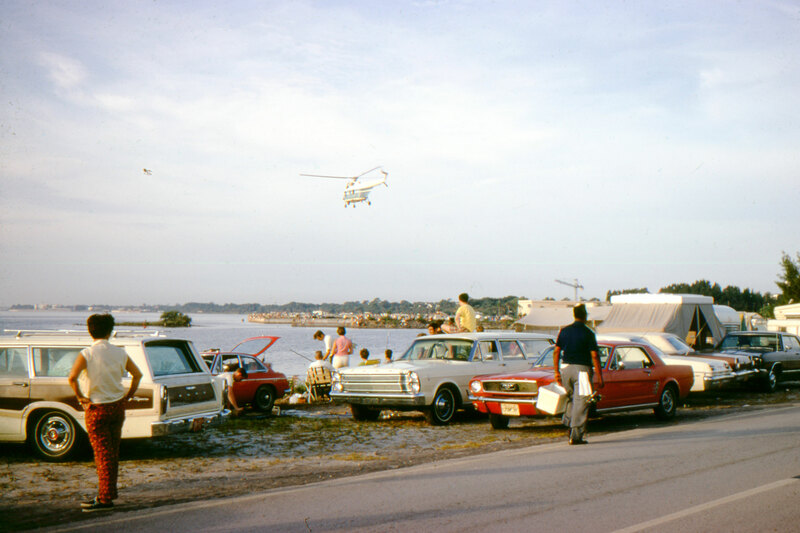 So what I am still after with all those people on this island in 1969 there has to be someone like me or my father that snapped a bunch of pictures and maybe of different angles different directions which could show the sign, cars, intersection, surroundings better then the blurred overhead aerial picture. So I haven't stopped yet looking. The sign area of the island is gone. The New Max Brewer Bridge moved all of that area, so the only hope of getting a picture of the VAB, launch site and island which is still there is from a boat on the water. I have not ruled that out. If anyone has any other ideas I would be glad to listen to them but I have it about 90% certain now with this latest picture. Thanks for all the previous responses to my quest, I just wish I had done this many years ago but life gets in the way. Hard to believe it was 50 years ago this July.